>> Live hyperlinks. ProQuest Dialog now features hyperlinks to non-patent literature and patents cited throughout its patent content collections. All patent and application numbers and many literature citations are now hyperlinked in ProQuest Dialog for one-click access of content. Searchers can click on a patent or application number link to run a search on the citation in all patent databases (regardless of how many are open). ProQuest Dialog provides hyperlinks for all patent and application numbers without excuses for missing links due to improper or unrecognizable number input formats from patent offices. Main, related, priority, cited, citing and family member numbers are hyperlinked in every patent document. >> Patent images. ProQuest Dialog users can now search and export full images for more than 149 million patents through the LexisNexis Univentio database. This includes 124 million images from the United States Patents Fulltext, 5 million images from the WIPO PCT Patents Fulltext, and 20 million images from the European Patents Fulltext. 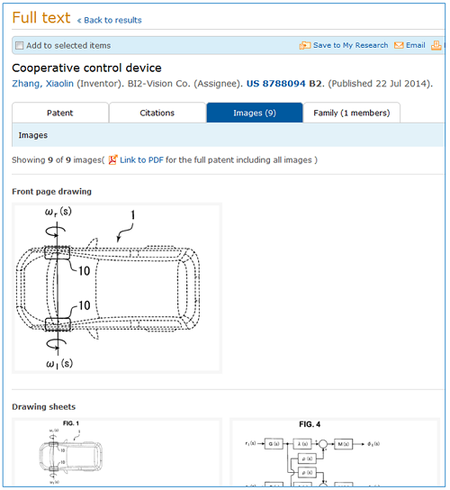 Images area also available for Chinese and Japanese patents, with additional countries to be added on an ongoing basis. >> ProQuest Dialog’s patents product provides access to 33 full-text patent authorities, including PDFs, claims, specifications, forward and backward citations, families, legal status tables and an additional 69 bibliographic authorities. Users can also search world’s largest collection of prior art available in a single, integrated resource. If you’d like to learn more about ProQuest Dialog’s patents collection, visit our website or contact us.